It’s been a long road but I finally got to the moon. This is the story of how I got there and how W2ZQ paved the way. I was born in Trenton, NJ and grew up just a few miles from the W2ZQ club station in West Trenton. I was first licensed WN2HRO in 1972. My mother taught me Morse Code to earn a Cub Scout merit badge. As soon as I could copy 5 WPM, my father took me to a W2ZQ VE (volunteer examiner) W2SVV – Cesar Arena. I received my ticket and purchased a Heathkit HF radio and a Clegg 2M FM radio at Trevose Hamtronics with paper route money. I was on the air. In the mid-1970s I was easily the youngest check-in on the PepperNet. I remained active in ham radio through Ewing High School and Trenton State College. I was a student member of W2ZQ and regularly used the 07-67 repeater and phone patch to call my girlfriend Mary, who is now my wife. At Trenton State College, I earned a degree in Electrical Engineering and met K2UYH – Al, who introduced me to EME Moon Bounce. In 1984, I found my first job with RCA American Communications in Princeton when a W2ZQ member took my résumé to RCA for consideration. I took a long break from ham radio (1984 to 2014) while I built a career in satellite communications, lived in Hopewell, NJ and raised three boys with my wife. In the spring of 2015, my interest in radio rekindled and I bought an eBay FT-847 and started building homebrew LEO satellite antennas. First satellite QSO was on the amateur satellite SO-50. I was hooked. My station grew from small yagis to big yagis and then I added an AZ/EL satellite tracking system. Then even bigger yagis, preamps and power amps. I made several hundred LEO satellite QSOs in a short time. 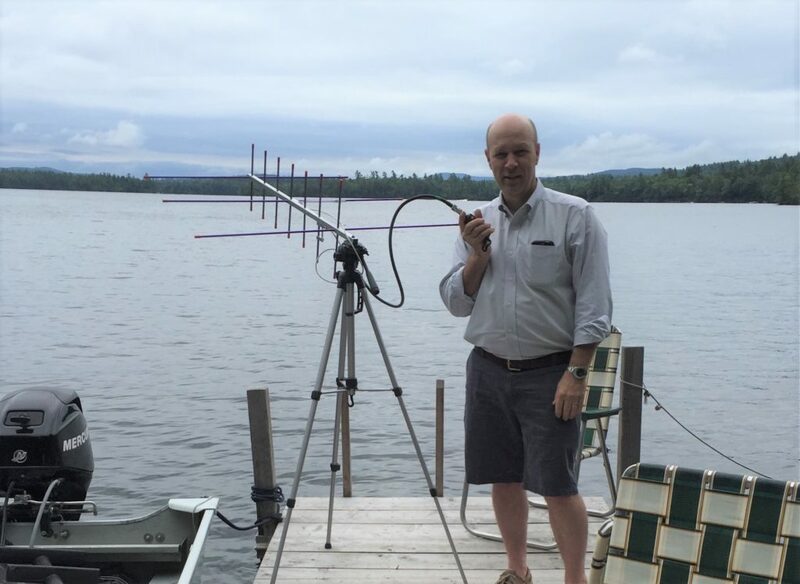 Amateur radio operator Paul Andrews, W2HRO, operates dockside in Squam Lake, NH. Photo courtesy Paul Andrews. I didn’t realize that my big satellite station had morphed into a small EME moon bounce station. I read that WSJT, developed by K1JT – Joe Taylor, made small station EME a reality so I decided to give it a try. On May 13, 2015, I worked I2FAK on 144 MHz via the moon as a passive reflector using WSJT and JT65 mode. My station was two, 10 element yagis and 200 watts. My 144 MHz EME system grew to two, 16 element cross-pol yagis and 1kw. As of the end of 2018, I have completed WAC, WAS, VUCC and DXCC all on 144 MHz via EME. I have expanded my home station to include a 4M dish for 432 and 1296 MHz EME. With more than 2000 EME QSOs, It’s fair to say that I have more hours on the moon than the astronauts. In December 2018, as a member of W2ZQ, I activated W2T and W2P special event from my home station on 144 MHz EME and made a few dozen QSOs with interested and excited hams around the world. If there is interest, I’d be happy to share my satellite and EME experience with other W2ZQ members and maybe build a satellite or EME setup at the club site. I’m very lucky to have been associated with W2ZQ for most of my life. Somehow W2ZQ is always a catalyst for what comes next in my life. The future is exciting.